When Elaina James got in touch about a blogging event she was organising around music and writing, I knew I wanted to take part immediately. For me, writing and music go hand in hand. I can't write without music playing, whether I'm using it as a tool for setting the mood of the scene I'm writing or simply as background noise. I can't write in silence. It's just plain weird. And I can't write with the TV on (unless it's on a music channel) but music strikes a perfect balance. I don't find it intrusive as I would a TV program and it takes away the silence - perfect! Music also helps me with characterisation. When I was trying to figure out who Ruth - the main character from A Beginner's Guide To Salad - was, I turned to her fashion and music choices. Ruth's sense of style is bold and cheerful, bordering on the quirky and I wanted to emulate this with her iPod playlist. Ruth is a massive fan of cheesy pop. It's certainly cheerful and can be quirky (Aqua's Barbie Girl is a perfect example) and it fit Ruth's personality perfectly. It also helps that I like a bit of cheesy pop myself so it wasn't too much of a chore to set up a playlist on Spotify for Ruth and listen to it whenever I was writing her scenes. S Club 7 became a firm favourite of Ruth's as the first draft progressed and I rediscovered the joy of the chirpy group myself. So when the band reformed for a nationwide tour in 2015, I made sure I had tickets to see them live. It was an amazing night and I'm sure Ruth would have LOVED it (I certainly did). 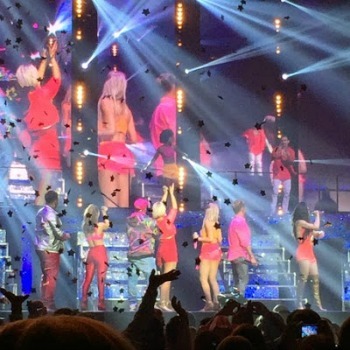 The group performed all their hits and everyone joined in. When silver star confetti fell down during one of their songs, I took a couple of pieces home as a memento of the night. 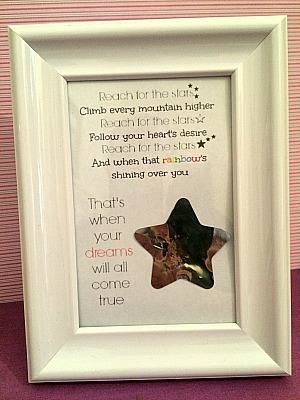 I wanted to frame one of the stars so I printed out a quote from one of my favourite S Club songs, Reach and glued the star next to it. At the time, I was a self-published writer still dreaming of a traditional publishing deal and I found the lyrics inspiring. With the star confetti and lyrics framed, I put it on my desk to act as inspiration whenever I was writing. 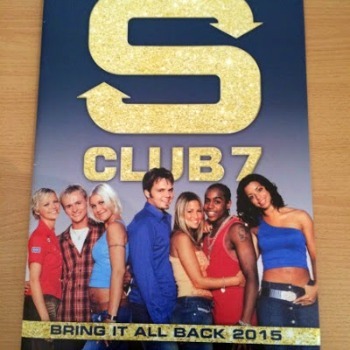 A few days after I'd been to see S Club 7, I received an email from Carina UK, an imprint of HarperCollins. I'd submitted a Christmas story to them (The Mince Pie Mix-Up) and they wanted to publish it. And not only that, they were offering me a two-book contract. My dream! It was coming true! Now, I'm not saying the star confetti has magical powers or anything but it - and the song - are very special to me. You can find out more about Elaina's James's blogging event on Mslexia here or visit her blog. What a lovely idea to frame the lyrics as a reminder of the concert and a source of inspiration. I'm going to have a think about what music my characters would listen to in future. Thanks for taking part in the blog event.